The so-called human touch is important in running a successful business, but let’s face it. Humans are distractible, unpredictable, and prone to making mistakes. Manual business processes are subject to errors with every point of human contact, even in organizations that pride themselves on great quality assurance practices. People are going to make mistakes. While certain processes, like taking care of customers, require individual attention and good human qualities, there are countless essential processes that can benefit from automation. The use and routing of forms in business processes is one example. Think about it: manual preparation, routing, information entry, exception handling, approval, indexing, and filing slow processes down and make them more costly end-to-end. 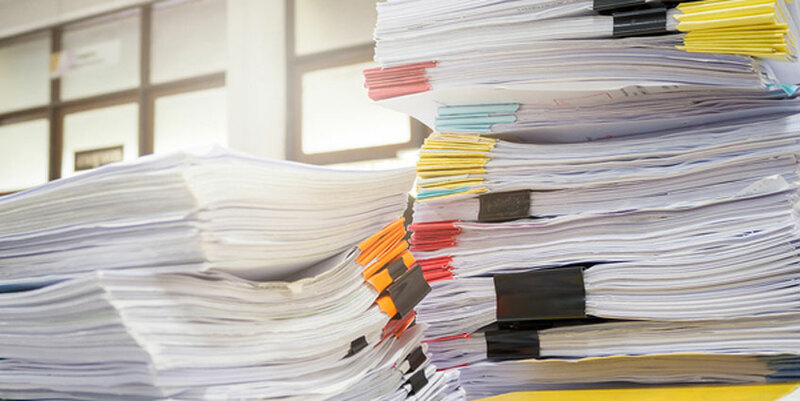 The more times a document is physically handled by people, the greater the chance it will be lost, damaged, or misfiled, and this increases costs all the more. The Association for Information and Image Management says that the cost to locate a missing document can go as high as� $120 when all is said and done, and replacing it can cost $220. Automation through the use of form software can eliminate many of these hidden costs and prevent a number of types of errors, like the following ones. Say the process for requisitioning new office equipment is a manual one involving paper forms. Someone is going to have to locate all the forms necessary to the process and ensure that the person requisitioning new equipment has all of them. Maybe you’re out of a specific form that’s required when a purchase goes over a certain dollar amount. Now someone has to find or print more copies of it and make sure the person who wants the equipment has a copy of the form. With a complex process, simply getting the process user ready to go can take an unreasonable amount of time. With paper forms, unclear instructions can lead to wildly inaccurate information. With electronic forms, your form software can be made to understand that a certain field must contain numerical information, or should contain a middle initial rather than a middle name. Form software can enable help screens that prevent confused phone calls and mistaken actions. When a manual form is filled in wrong due to unclear instructions, the form recipient has to track down the person filling it out, explain what he or she did wrong, and then wait around for them to redo the form correctly. Errors on paper forms have a way of propagating as more people in the process handle the forms. A slight misspelling or unclear handwriting can eventually� turn “Luna Enriquez” into “Lunchbag Rodriguez.” With electronic forms that are put together into automated workflows, errors don’t magnify like some slumber party game of “telephone.” In fact, form software can be used so that someone enters information once and it instantly populates multiple forms, so they don’t have to keep entering the same information repeatedly. Finally, manual processes involving forms depend on all the necessary forms being submitted to the right people. Depending on how complex the process is and how many people have to handle forms along the way, it’s all too easy for one form in a package to be lost, necessitating the frustrating retracing of steps and possibly filling out the form all over again. This annoys multiple people and slows the whole process down. But when your form software automatically routes completed forms to the correct recipient, forms don’t slip to the bottom of a pile of paper, or accidentally get left in the break room. Form software that lets you automate workflows greatly reduces the opportunity for error in processes. By always having the right forms for the process, and ensuring they are automatically routed to the right person, the process is faster, forms aren’t lost, and nobody has to worry about filing them alphabetically. PerfectForms makes it easy to automate processes using custom electronic forms. Simply drag and drop fields to create pixel-perfect electronic forms that can even be branded with your company logo and colors. You can then arrange forms into logical workflows and ensure that completed forms go to the right person every time. Error rates plummet, processes go faster, and companies spend less time chasing down errors and lost forms. What’s not to love? To find out more,� check out our demo and see for yourself how easy error-free electronic forms can be. This entry was posted on Saturday, March 7th, 2015 at 2:35 am	and is filed under PerfectForms. You can follow any responses to this entry through the RSS 2.0 feed.